Before reality TV, and even still to a very large degree now, the best known name associated with performance cars to the average person is Carroll Shelby, and with good reason. Shelby has been considered a legend in the field for decades, and his influence is still strong to this day. He died today at the age of 89, as a result of complications from an illness. Carroll Hall Shelby was born in the tiny town of Leesburg, Texas, and suffered from poor health throughout much of his childhood. By his teenage years his health improved, and, according to stories, received a speeding ticket the very first time he was loaned his father's Willys. His interest in moving very, very rapidly continued, as he served in World War II as a flight instructor and test pilot. Before building the racing cars he's known for, Shelby was a driver himself, racing for a number of teams throughout the ‘50s, including Allard, Aston Martin, and Maserati. In his last year of driving, 1959, he won the 24 Hours of Le Mans for Aston Martin. But more than a driver, Shelby will be remembered as a man who built many, many fast cars. The first, and in many ways still most iconic Shelby came about in 1959, when Shelby obtained a license to import AC Ace cars from Britain. Shelby's revelation was to replace the straight-6 Bristol engine with a Ford 260 V8 engine, creating a light, incredibly fast sports car. Shelby went on to work with all of the Big Three American car companies, producing such car as his Series 1 with GM mechanicals, the Dodge Viper, and the Ford Mustang Shelby line that is still in production today. Shelby's career hasn't been free of controversy: Shelby's company has been associated with firms that have allegedly used prison labor to build Shelby Mustangs, and prior to that, in the 1960s, Shelby was found to have skipped large blocks of VIN numbers on cars to give the impression many more were produced, to allow his cars to be eligible for homologated racing classes. In the 1990s, Shelby claimed to have found the "missing" chassis and frames, and began finishing and selling the cars. It was later discovered the "found" cars were, in fact, built from scratch. Interestingly, those cars, now called "continuation" cars, are still sold today as the CSX4000 Cobras. There have been other VIN-related issues, and sexual assault allegations against Shelby from last year. Shelby has also had some stranger ventures, including a stint as a chicken farmer, founding a Texas chili festival, and once having a brand of deodorant named after him, Carroll Shelby's Pit-Stop. In recent years, health has been an issue, with Shelby receiving a heart transplant in 1991. The experience of the transplant was so powerful to Shelby that he started the Carroll Shelby Children's Foundation to help children in need of organ transplants. 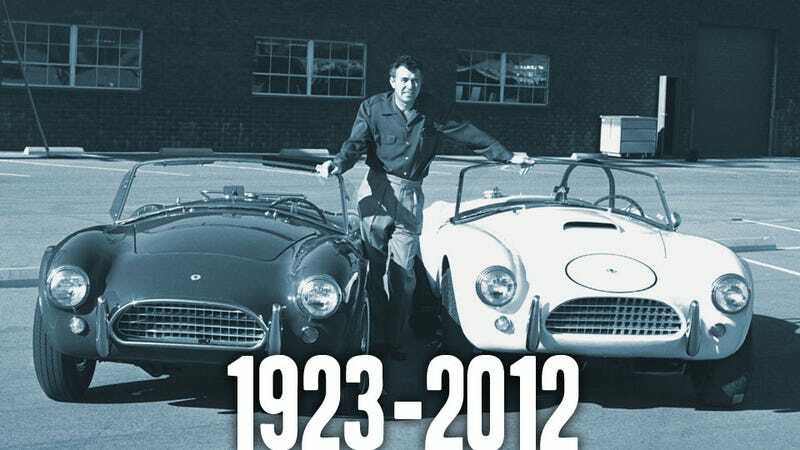 Carroll Shelby was truly a legendary figure, and he will absolutely be missed. I don't know what's funnier, that Bill Cosby bumped into Carroll Shelby in a grocery store back in 1966 or so, or that he wrote one of the greatest comedy bits (about cars) of all time about what happened next. From the time he was a child, Carroll Shelby was into cars. After a brief but understandable diversion into airplanes during World War II, Shelby eventually made his way back to his passion, racing and later building some of the world's fastest cars.